McStay: won an All-Ireland club title as St Brigid's manager in 2013. 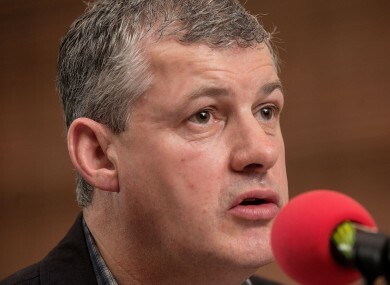 KEVIN MCSTAY IS set to team up with Fergal O’Donnell as the new joint managers of the Roscommon senior football team. The duo met with the county board’s headhunting committee and agreed to succeed John Evans for a three-year term with the option of a fourth. If the decision is ratified by the county executive and approved by the clubs, it will be McStay’s first job in senior inter-county management. The former Mayo star turned RTÉ pundit famously led St Brigid’s Roscommon to the All-Ireland club title in 2013. He joins forces with O’Donnell who managed the Roscommon minors to their Connacht and All-Ireland wins in 2006, and later won a Connacht title as senior manager in 2010. After three years in charge, O’Donnell stepped down in 2011 citing work commitments, but now returns to take charge of a team facing into Division 1 football next spring. Liam McHale, David Casey, Stephen Bohan have all been linked with roles in the new backroom team, Colm Keys reports in Tuesday’s Irish Independent. A Roscommon statement said: “A short time ago the committee appointed to find a successor to John Evans as manager of the Roscommon senior football team reached agreement with Fergal O’Donnell and Kevin McStay and will recommend to the county executive that the duo be appointed as joint-managers for a three year term, with the option of a fourth year. “Subject to approval by the executive later this week, their names will be brought before clubs for ratification at next week’s meeting of the county board. Email “Kevin McStay set to be named joint-manager in new Roscommon double act”. Feedback on “Kevin McStay set to be named joint-manager in new Roscommon double act”.